The complete DKITS for extracting dusts and distributing energy are the answer for those seeking a practical, professional and incredibly flexible solution. 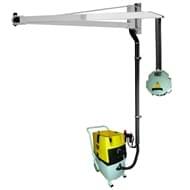 Connecting a mobile unit to a fixed arm makes the work area free of disturbing elements but at the same time, by disconnecting the portable unit, any work area can be covered. 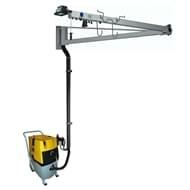 The 3 and 6 mt self-supporting arms can reach the vehicles without extensions and connecting cables, so that the work area is safety and cleaner. 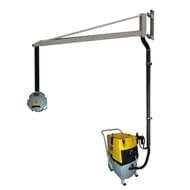 The complete DKITS combine in a single product the features of the self-supporting arm DARM and the trolley-mounted unit DMOB2 with an already prepared connecting system.